See more objects with the tag exhibition, arabesques, space divider. This is a Door panel. It was manufactured by JA FELT Studio & Lab. It is dated 2008 and we acquired it in 2010. Its medium is center: bleached jute burlap, wool, silk roving; border: recycled coffee bags, merino wool, silk roving, reclaimed metallic silk organza; backing: wool, linen; rope: merino wool, lyocell, honey tussah silk and its technique is felted. It is a part of the Textiles department. Palace Yurt is a door panel from a larger installation, designed and made by Janice Arnold for the museum’s 2009 exhibition, Fashioning Felt. The piece is inspired by a traditional yurt door. A yurt is a portable home used by nomads in Central Asia. A yurt’s door is, essentially, a carpet hung over a doorway that can be rolled up during the day. Typically, a yurt door has some type of talismanic symbol to guard the home against evil. In this case, Arnold’s piece shares the traditional field and border format of Central Asian carpets and comes with hand-braided cords to roll it up. 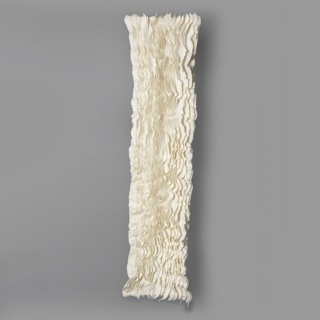 The field is made by a contemporary felting technique called nuno felting, which is felting through a woven substrate. 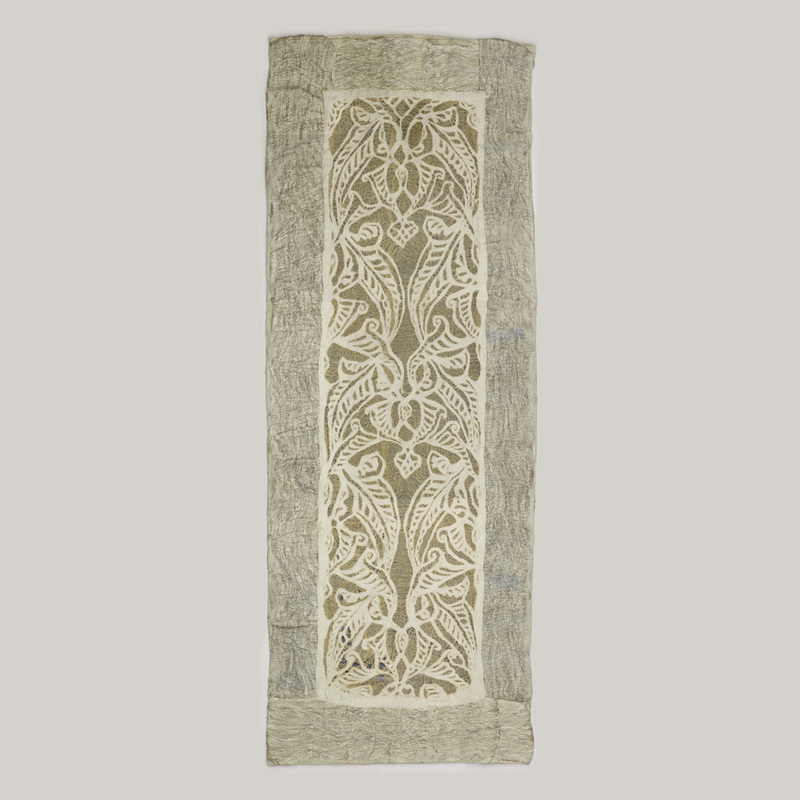 In this case, a loosely woven jute fabric creates a heavily textured surface, yet the piece is also reminiscent of many 17th-century laces in the museum’s collection. Arnold is a self-taught felt maker. While working in visual merchandising for Nordstrom, she received an assignment to produce a large number of felt sculptures for window displays. She traveled to Central Asia to try to source the material, learned the felt-making process from the local women, and has been working exclusively in felt ever since. Arnold works primarily with large-scale installations and theatrical projects. Her clients include Cirque du Soleil, Royal Caribbean Cruises, Disney Corporation, LA Opera, Universal Pictures, Wieden + Kennedy, and The Rockefeller Group. This piece speaks to both the most traditional use of felt—the yurt—and the most current techniques being explored by felt artists. It is credited Museum purchase through Exhibition Funds.